Lightweight Gesias “JZ” Cavalcante claims Dream is outstanding, as in eight months outstanding with his payment. Although the talented Brazilian dropped a split decision loss to Katsunori Kikuno in July 2010, he states the Japanese promotion has yet to pay him for services rendered. “Dream? Well, my fight with Kikuno they didn’t pay me yet! 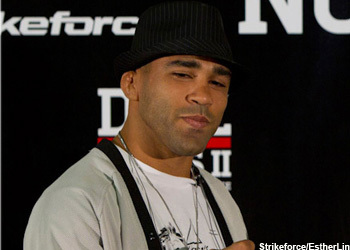 I fought in July and they still haven’t paid me,” Cavalcante told FightersOnly. “Japan has a lot of troubles in its MMA right now. I hope it gets better because it’s good there, fans have a lot of respect, they know you and they are very knowledgeable. It’s fun to fight out there. While most would have sent Dream to collections after the 90-day mark, JZ took a more technological approach in trying to gather his earnings. In steps Twitter, which the 27-year-old used to formulate his own collections agency. He’s hoping the additional heat will help add some more zeros to his bank account. “Please my tweet-friends do me a big favor. K-1 & @dreamPR still didn’t paid me for my fight July. RT please and show you support for mma,” he tweeted. Within seconds of alerting his fans that Dream was still in the red, his followers proceeded to blast the popular Japanese promotion for their reluctance to pay their tab. While some focused on Dream’s poor business practices, others highlighted the fact they might be financially incapable of forking over payment. Cavalcante owns an impressive 15-4-1 (1 NC) professional record, with 12 of his wins coming of the devastating finish variety. He’s anxiously awaiting his next assignment from Strikeforce, a company that has managed to pay their bills on time.